There’s nothing like a great big dose of local knowledge to help with planning your Scottish self-catering holiday – who better than a holiday home owner to suggest lovely places to visit during your stay? This month we’re delighted to feature a fantastic guest post by Debra Storr of Varis Holiday House, located 5 miles from Kyle of Lochalsh, on a tour that includes magical views, fascinating historical sites and wonderful wildlife watching opportunities – and takes you over the sea to Skye. As our holiday house, Varis, sits above the A87 at Reraig, Balmacara, that is where we will start but as it is a circuit, so long as you catch the ferry while it is still running, you can start anywhere. 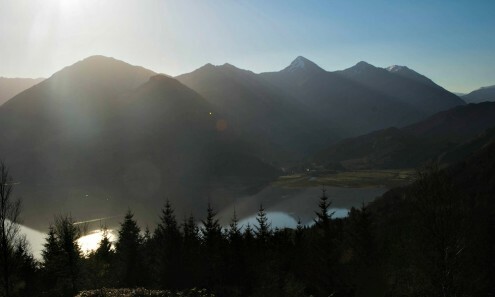 At Reraig, there are super views across Lochalsh to the Glen Elg narrows and along Lochalsh to the Skye Bridge. Glen Elg Village is mainly a pleasant single street including the Glen Elg Inn (serving good local food 12-2.30 and 6.30 to 9.30pm). Overlooking the bay is the War Memorial, a fantastic vantage point for panoramic views up to Kylerhea, across to Skye and down towards the Point of Sleat. Head south to the Glen Beag Brochs, some of the best preserved Iron Age structures on the Scottish mainland. These fortified round houses were built some 2000 years ago and still stand 10m tall. Returning to Glen Elg village, we then head along the coast north to the delightful Glen Elg Ferry. The Glenachulish is the last manually operated turntable ferry in Scotland carrying just 6 cars at a time. This is a hand operated turntable ferry and at over 40 years old is part of our heritage. The ferry belongs to the charity the Glenachulish Preservation Trust and operated as a community venture. The 2014 fare £15 for a car and four passengers is worth it to preserve this ferry, probably the oldest route onto Skye from the Scottish Mainland. The Ferry runs Easter to mid October 10am to 6pm, weather permitting. 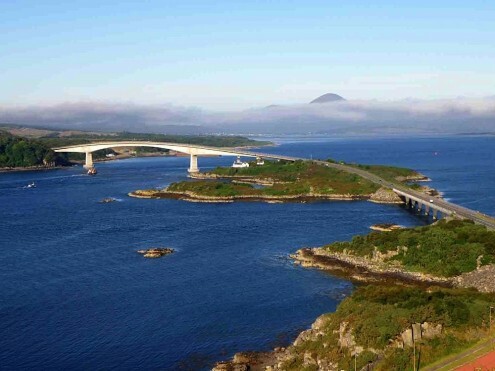 Eilean Bàn (White Island), connecting the Skye bridges (pictured in the centre), is a six-acre nature haven. Originally home just to the lighthouse keepers and their families, it later became the residence of the author and naturalist, Gavin Maxwell. 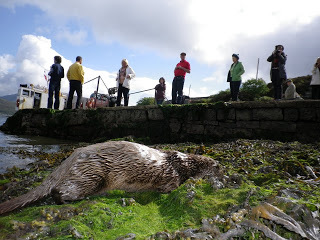 Eilean Bàn supports a wealth of wildlife and natural heritage including, of course, otters. Nature trails some suitable for wheelchair users wind around the island leading to different points of interest, including an award winning wildlife hide, a viewing platform and a sensory garden, making a fine last stop on our tour.